My computer is running very slow, so I opened up the task manager expecting to see excessive cpu or memory usage. Nothing. So I closed all applications other than task manager. Still slow. 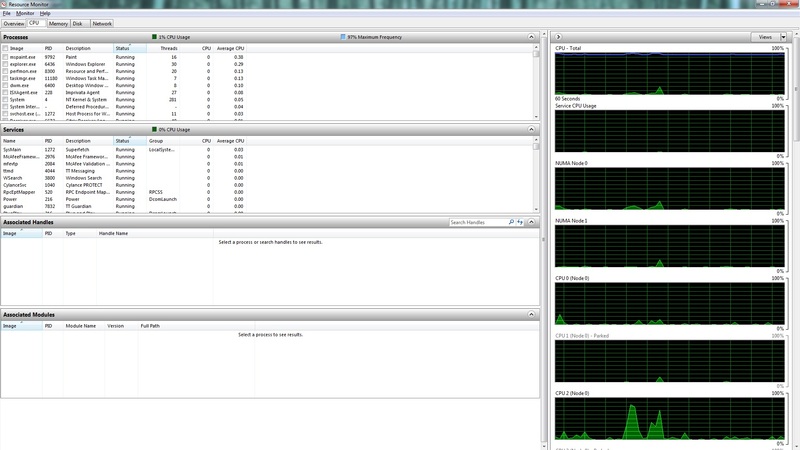 Then I opened up the resource monitor, and found the cpu being used almost to the max! What could cause such a discrepancy? 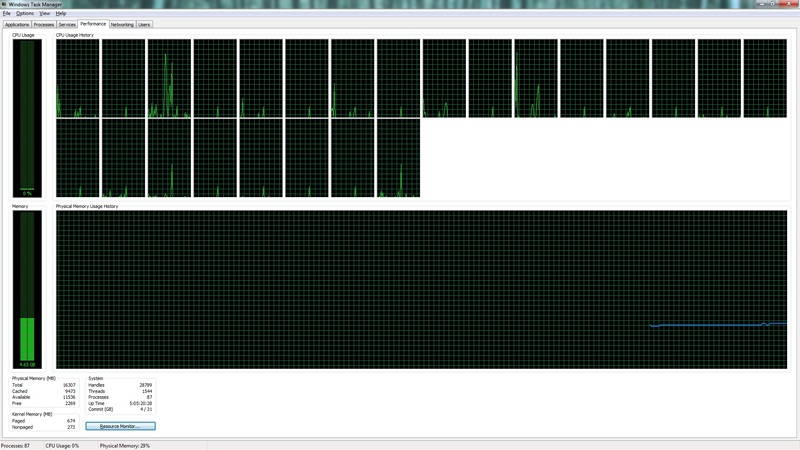 Another words, why does taskmgr show barely any cpu usage, while the resource monitor shows that the cpu is overloaded? EDIT: Others have pointed out that I incorrectly identified the blue line in the resource monitor as cpu usage. Thank you for that, but I still don't know what to do about my slow computer. Disable everything in Startup that is non-critical and then re-enable them one at a time if you really need it to fire at Startup. Run Malwarebytes for adware/malware - fix anything that is found that you don't recognize. Sometimes, these programs identify legitimate processes that can be ignored. Boot into normal mode and run HackThis. You can send the log to the HackThis community or try to analyze and repair anything you see. At this point you can reboot again and then start poking around. My bet is that your scans will uncover some things you didn't know you were running. You should see a noticeable difference after doing all of this. Not the answer you're looking for? Browse other questions tagged memory cpu performance task-manager resource-monitor or ask your own question. what can impact windows performance besides Page File Usage, Available Physical memory and CPU usage? Why is my private memory usage so low compared to commit memory? In the “High Performance” power plan, why does the CPU always shows 100% usage? my windows 10 pc got really slow although CPU and memory usage is fine. what else can I do? Windows 7: Why is there a Task Manager CPU usage discrepancy?